So – when you are just starting at squash and especially when you are playing with someone who is just starting (assuming you are an experienced player) – use a faster ball. 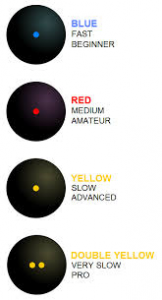 Absolute beginners should start out with a slightly larger ball that’s much faster (especially when cold) than a 2 yellow-dot ball – moving on to a blue or red dot and then a single yellow dot – gradually as their technique improves. Even quite good “leisure players” can benefit from using the slightly faster one dot yellow. A trick I often use that’s maybe worth passing on is to drop the ball into a cup of very hot water before you start the knock -up. Even a 2-dot-yellow moves very fast after that and you can keep it hot quite easily if you are playing reasonable squash. And remember – it doesn’t matter too much WHAT type of ball you are using, they all hurt a lot when you get one pumped into the back of your leg or your back – so play safe!! This entry was posted in For Beginners, General and tagged Ball speed colour. Bookmark the permalink.